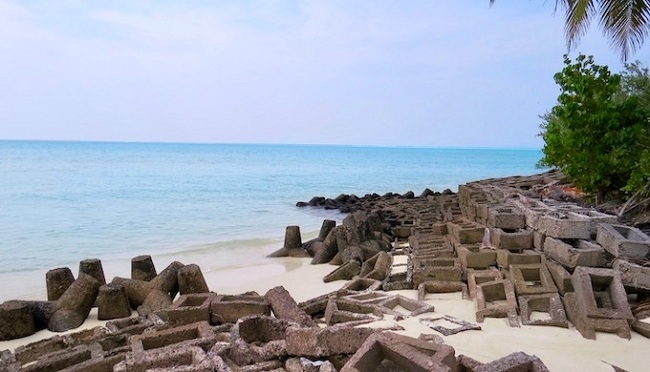 Rapid erosion, turbulent seas and rising ocean temperatures brought on by climate change pose serious threats to the coral atolls of Lakshadweep. An island sank under the sea. Nobody noticed. Even today, maps of the Survey of India – the government agency tasked with mapping the country’s territory – show Parali I as a small island in the Bangaram atoll in Lakshadweep archipelago in the Arabian Sea, some 400 km off the west coast of mainland India. But the uninhabited coral island is not there any more. Its official territorial marker with India’s Lion Capital emblem was barely visible at low tide on a winter afternoon. “When I began cataloguing the flora and fauna of Bangaram atoll in 2011-12, I found that there were only four islands in the lagoon, despite Survey of India maps showing five. The fifth had gone under the sea due to erosion that far outpaced accretion on the western side of the island,” said Hidayathulla, a native of Angroth, the largest island in the archipelago. “I informed the authorities but the maps are yet to be updated.” Hidayathulla went to the media in 2017 about the disappearance of Parali I, but the development has been largely ignored. The plight of the island nations has received widespread international attention and global agencies are working overtime to address their issues before it is too late. A case in point is Tuvalu, with its nine islands and a population of around 11,000. There is even a move to give special passports to residents of these island nations, so that they can settle in other countries. See: Climate passport, anyone? Lakshadweep, the only coral island chain in India, has clearly started showing the impacts of climate change, says P.C. Hameed, Deputy Collector at Agatti Island. Hameed, 58, said that the waves during the southwest monsoon are much higher today than they were in his childhood. Both the number of storms and their intensity have increased. 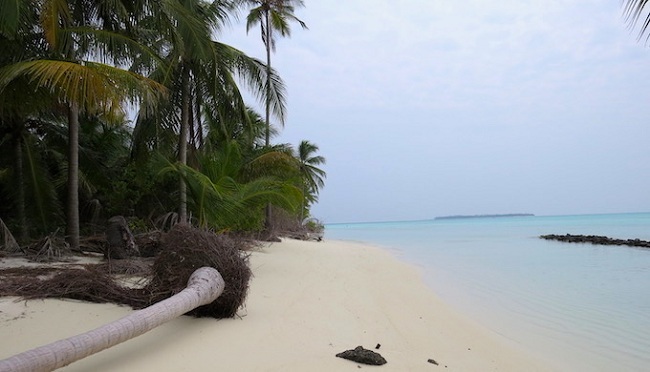 “This is impacting the livelihoods of the people as coconut trees fall in high winds and fish catches decline,” said Hameed, a native of Chelath Island. Coral islands the world over have a unique defence system in the form of reefs. Coral reefs play an important role in island formation and providing a resource base for islanders. They also act as wave breakers during storm surges. Even during turbulent seas, the water inside a lagoon is usually calm, and that is mainly due to the encircling coral reef. While environment department officials grapple with day-to-day issues related to waste management and the like, there is not much scope to take action that would result in long-term climate change mitigation. In the meanwhile, rampant removal of corals at various islands for construction continues, further damaging the stressed ecosystem. The original article was published on India Climate Dialogue and can be found here.